When I tell people I study gulls, I often get a funny look and a comment… “why would you study them, they’re just garbage birds!”. I always jump to the defense of these feathered creatures and spout off facts about their long-distance migrations from the Arctic to the Gulf of Mexico, or a diatribe about their foraging versatility. Herring gulls feed on a wide range of foods including clams, crabs, worms, insects, urchins, mussels, mice, berries, songbirds, and even other seabirds. They’re also know for scavenging on dead things… something they do a lot of on Sable Island where dead seals wash up. And yes, they do feed on garbage, french fries, popcorn and just about anything they can get their beaks on. A sighting report came in last week confirming that yes, Sable Island gulls also feed at garbage dumps. Staff at the Island Waste Management Corporation in New London, Prince Edward Island, tracked me down through this blog to report a pink tagged gull that has been frequenting this waste transfer station for several weeks now. Kevin Curley and staff managed to snap a few pics but Kevin notes that this gull “wouldn’t pose properly” for a nice clean view of the wing-tag number. Zoomed in on the photo below, the leg band reveals this garbage loving gull as AAR. 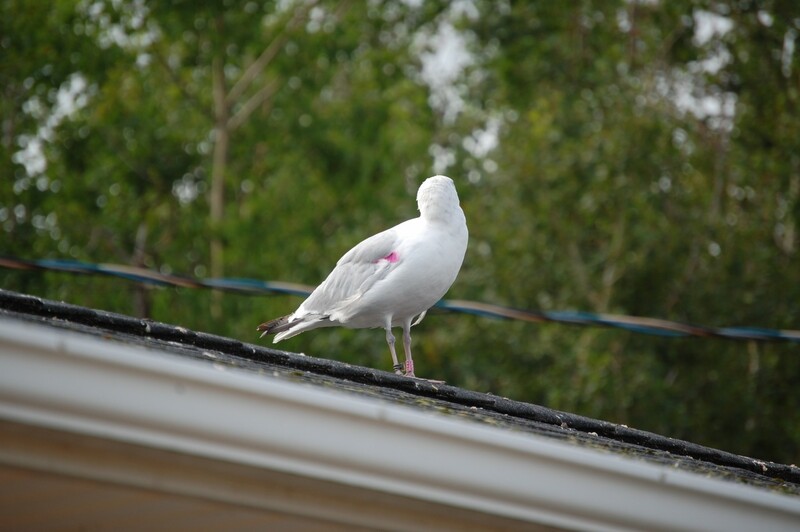 Staff also reported seeing a gull with a similar tag that was “red” rather than “pink“. We only used pink tags on Sable, so the red tagged bird was likely from the DCR study in Massachusetts. What are the chances of two wing-tagged birds from different studies showing up at the same place at the same time? 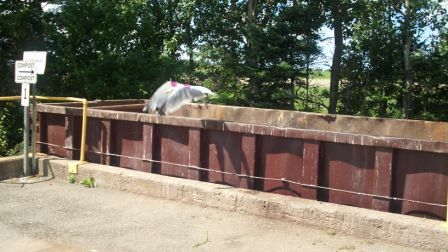 Pink tagged gull from Sable Island was seen fleeing from a dumpster at a waste transfer station in New London, PEI. Photo courtesy of Joan Harding. Still patrolling this facility on September 9th, a photo by Kevin Curley reveals the mystery bird as AAR. The wing tag was faded but a close up of the leg band was undeniable.